Heavy-Duty portable wheel step that is the perfect solution for quickly providing the extra height needed to load gear and equipment on top of car roof racks on tall vehicles. Easy to use step provides the added height needed to load gear onto the roof rack any tall van, minivan, SUV, truck, station wagon and more. Heavy-duty construction and non-slip platform ensures sure-footed loading. 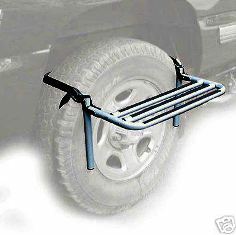 Attachment strap attaches easily to either rear or front tire, regardless of wheel-well clearance. The Thule 232 Step Up wheel step conveniently folds flat for easy storage when not in use. Also includes storage bag. Easy-to-follow instructions included. Thule Racks Lifetime Warranty!